Canadian VFR and IFR charts, as well as the Airport Facilities Directory, can be ordered online from vendors such as Sporty's and Map Town or from various official Canadian sources. Don’t be surprised, however, if the charts are not available by the scheduled valid date. For some reason, NavCanada’s printer doesn’t always deliver the charts to the vendors in a timely fashion, so it’s often advisable to check availability by phone. 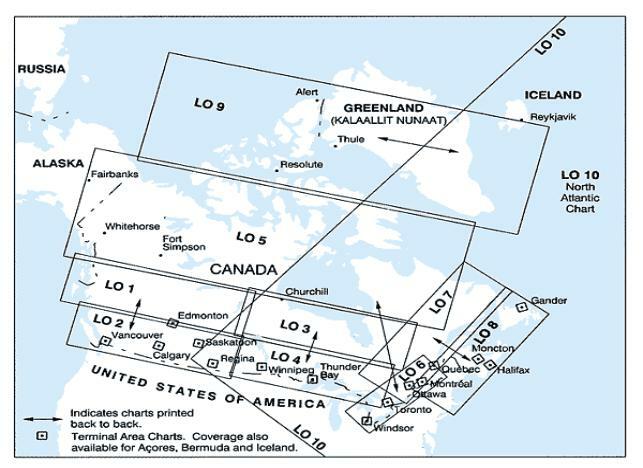 This site contains a comprehensive online selection of Canadian aeronautical charts and information. Some of the files are quite large, however, so where possible they have been extracted and presented in this Alaska Flying Guide under a specific airport name. General information from the Canadian Airport Facilities Directory should be consulted when reading the legends for a given Canadian airport. Please note that most gravel fields do not have fuel service available; in fact, an airport in Canada does not have fuel unless it specifically says so in a given airport’s directory information. Listed below is airport information and, where available, IAPs and airport diagrams, for the Canadian airports mentioned in Sections Two, Three and Four in this Alaska Flying Guide. Please note that these are copyrighted materials, have valid dates from mid-2004, and are presented for informational purposes only. 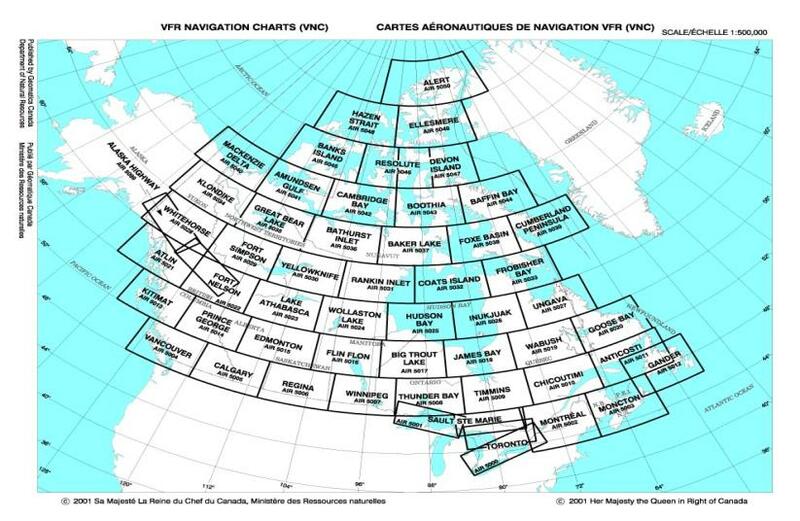 Shown below is a map of the various regions for Canadian enroute low altitude IFR navigation charts. Click on the links below the map to see a specific chart (each is roughly 1.5MB, so expect slow download); then use Adobe’s magnification tool at 300-400% to see it in readable detail. 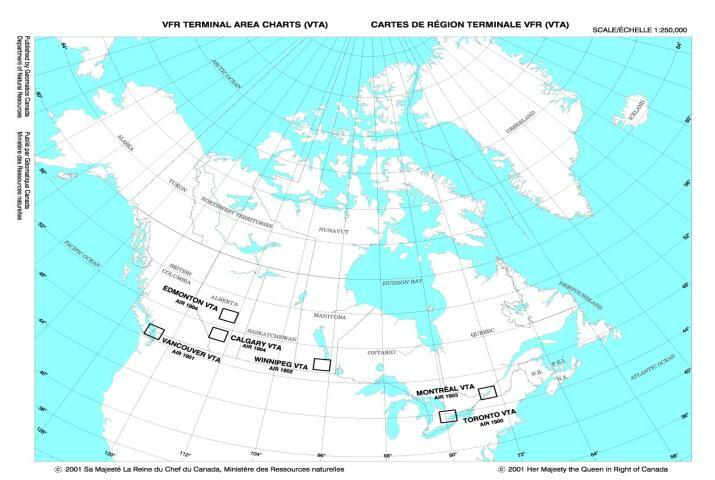 Shown below are maps of the various regions for Canadian VFR, WAC and terminal area navigation charts. These may be helpful in deciding which charts to take along on a trip (note that there is a specific VFR chart for the Alaska Highway, which incorporates parts of Fort Nelson, Fort Simpson, Atlin and Whitehorse). There do not seem to be any readable copies of these charts available online, as was the case with the Canadian IFR charts. 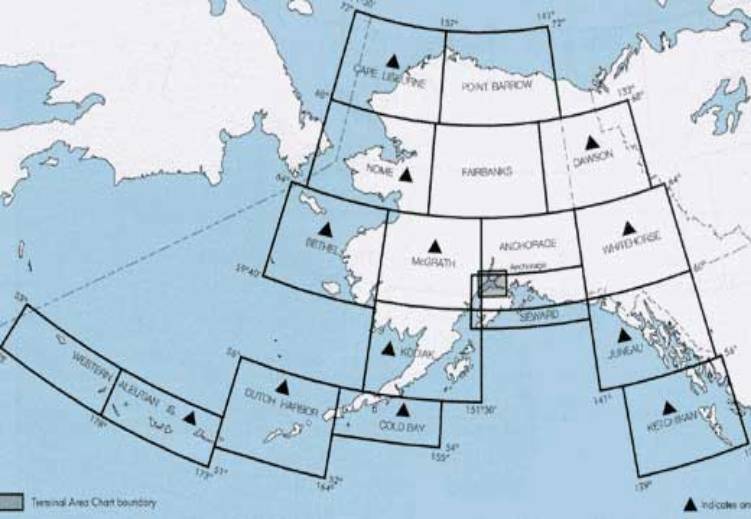 Listed below is airport information and, where available, IAPs and airport diagrams, for the Alaskan airports mentioned in Sections Two, Three and Four in this Alaska Flying Guide. Please note that these are copyrighted materials, have valid dates from mid-2004, and are presented for informational purposes only.